So I’m back from tour now. I’ll spare you any details or adventures, no one cares. The big event I’d like to talk about came up two weeks ago with Page 221. It seems I brought Fire Slicer back to life, and I didn’t even know it. Fire Slicer was killed off in THE MOON WARRIORS GO CAMPING, a one-page story Malachai drew. I recall reading it back in 2011, but I apparently didn’t recall that the Moon Warriors were eaten by the God Of All Bears. I began to see the comments roll in about Fire Slicer being alive again and got all irritated with myself. I’ve been dreading this because in these big battle scenes, I’ve been drawing ancillary Axe Cop characters here and there and then wondering- are they alive? What’s the continuity, here? I had similar concerns about Leaf Man, Hand Cuff Man and Mr. Stocker. I’m pretty sure Mr. Stocker’s dead according to continuity, but I just couldn’t resist putting my favorite non-Axe Cop Axe Cop character in my story. I went to Ethan a few times asking up on whether a character is alive, but the dude was planning a wedding, drawing a comic, overseeing a TV show and doing any number of other things. Eventually he just said “draw who you want, don’t worry so much about continuity.” That’s not a direct quote, mind you, I don’t feel like hunting through gmail to find that. Anyway. In a kid logic universe, death may mean even less than it does in the Marvel Universe. Hell, Axe Cop was killed on the same page where Fire Slicer returned and it meant almost nothing. So, yeah, I brought back Fire Slicer by accident. Whoops. Ethan says not to worry about it for reasons that remains to be seen. Let’s just say that God Of All Bear stomachs aren’t all they’re cracked up to be. and if you guys don’t die by then, I’ll invite you! Me: “I dunno Mia, this is a pretty scary story. Slightly spammy commenting to say P.S. – I was so happy to see a Moon Warrior, I’d forgotten he was dead. Stress not, man! Actually, I was just concerned because The Wrestler is back. According to Ask Axe Cop, The Wrestler is waiting for Axe Cop so he can kill him, growing more and more evil and strong as he waits. So yeah. Figured the Moon Bros should come back. Not sure if the MBGC was fully canon or not anyway. Hey, my explanation for the Moon Warriors’ appearance in President of the World was that Axe Cop also used the portal gun to go back and tell them to choose world peace instead. Also consider that Mr. Stocker, along with Sockarang’s mother, had already been mysteriously brought back to life in The Dogs after being confirmed dead in Bad Guy Earth, so I began to suspect that the cats’ machine had some kind of unexpected resurrection side-effect. 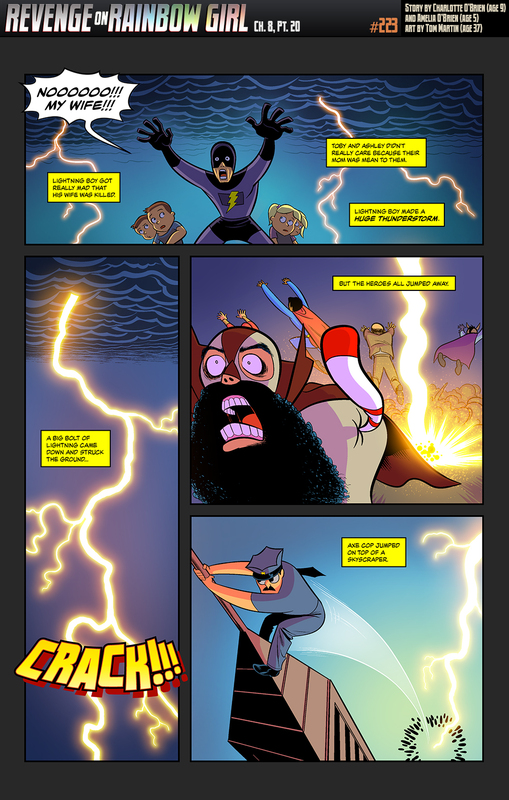 For this story, I’m accepting the idea that if Axe Cop wants any of his hero buddies back, he will get them back somehow. There have been so many of these weird reappearances in Axe Cop already. The only reason the Moon Warriors might be problematic is that it’s been clear for a long time that Malachai was going to eventually resurrect them, and that there would be a story to go with it. But, as Ethan points out, for that self-same reason you don’t have to worry about it. Bat Warthog Man is a man who was driven to a life of crime fighting when bad guys stole his friend. Seeking to gain the power of the bat and the warthog, he went into a forest, where he encountered a bat and a warthog who fused into a bat warthog which then bit and horned him. He gained the powers of the bat and the warthog but also took on their hideous fused looks (but only at night). Powers: The powers of the bat and the warthog. Includes flight, horning and other powers. BWM is also restricted to fighting crime at night, since bats are nocturnal. First Appearance: Page 205 - What the heck?